Since late 2016 when the signs of economic resurgence first appeared, the global economy has come a long way. The world is now experiencing a synchronous rebound in economic growth after years of post-financial crisis malaise. Every major region is enjoying stable performance. A number of regions, including the Eurozone, are growing above the expectations of forecasters. The global economic rebound, tax reform law, and the resumption of a dollar depreciation that began in early 2017 influences the MAPI Foundation’s outlook for the best U.S. manufacturing growth performance in more than a decade. The current forecast represents a measurable jump from the November 2017 outlook. In fact, it is a near doubling of our projection for average U.S. manufacturing growth for the 2018-2021 period from 1.5% to 2.8%. While seemingly dramatic, this reflects our expectation of a return to pre-financial crisis growth rates for the factory sector. Such performance has long been impeded by the 2008 panic, the Great Recession, and the weak and risk-laden years of global performance that followed. A confluence of bullish forces is catalyzing the long-awaited return to historically normal manufacturing growth. The pace of capital equipment spending, a key driver of manufacturing profitability, has been accelerating. After growing by a sluggish 3.5% during 2015 and then contracting by 3.4% during 2016, equipment investment growth accelerated to 4.8% during 2017. Capital spending growth for the third and fourth quarters of 2017 averaged a strong 11.1%. The passage of the Tax Cuts and Jobs Act of 2017 lowers the corporate tax rate and allows businesses to more quickly write off the cost of equipment investments. Over the short-term, both are likely to support and strengthen what have already been positive U.S. manufacturing growth trends. After plateauing in October and November of 2017, the dollar has resumed the depreciation that began in the early months of 2017. This is a significant boon for the price competitiveness of U.S. manufacturers in global markets that have become increasingly important for their profitability. While the correction in the high-flying stock market was long overdue, the market pullback that began in late January has been particularly rapid and volatile, adding a dose of uncertainty to an otherwise bright economic picture. The measurable rise in the yield on the 10-year Treasury note, now at the highest level since the early months of 2014, has arguably been the primary catalyst for the equity market decline. The interest rate rise, catalyzed to some extent by vague hints that low inflation might be on the cusp of rising, has been a reminder that eventually financial conditions will tighten. The rise in interest rates and the return of significant stock market volatility creates both uncertainty and concern about the near-term path of monetary policy, particularly as the new Federal Reserve Chairman assumes his position. If the Fed reads the rise in bond yields as signifying that they are behind in their efforts to adjust the short end of the yield curve properly, then a more hawkish policy than expected may be deemed appropriate. While showing modest signs of improvement, labor productivity growth in the U.S. manufacturing sector remains sluggish, constraining longer-term output growth prospects even as strengthening global performance and tax reform catalyze considerable improvement over the next few years. The MAPI Foundation projects that between 2018 and 2021 average annual U.S. GDP growth will be 2.5%, a significant improvement over the 2.1% average growth that we projected in our November 2017 report. Our brighter forecast for overall growth has been especially buoyed by the stronger outlook for capital equipment investment, a GDP component of importance to manufacturing prospects given the large population of machinery and machine parts producers in the domestic U.S. manufacturing base. We currently project that capital equipment spending growth between 2018 and 2021 will average 6.8%. This is a measurable acceleration from the 3.7% average that we projected in our November 2017 report. The improved capital spending forecast is spurred in part by our expectation that widely improved global economic conditions, and business tax reform will motivate executives to put at least some of a large stock of dormant cash to work. 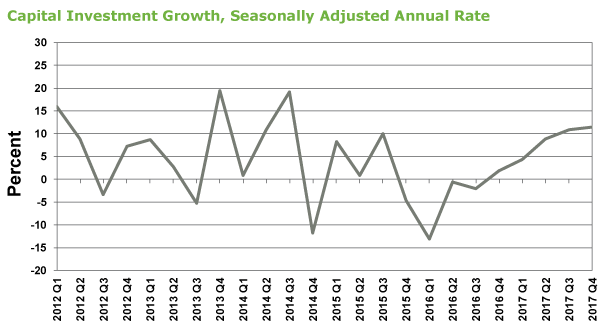 Over time, if equipment investment spending continues to accelerate it should result in at least a moderate improvement in the sluggish pace of manufacturing labor productivity growth, as demonstrated by MAPI research. As a further boost for U.S. manufacturing prospects, we now expect the pace of annual export growth to average 6% between 2018 and 2021, still modest by historical standards but nearly double the 3.2% average that we projected in November. If the dollar continues its persistent fall, export growth will likely accelerate further. 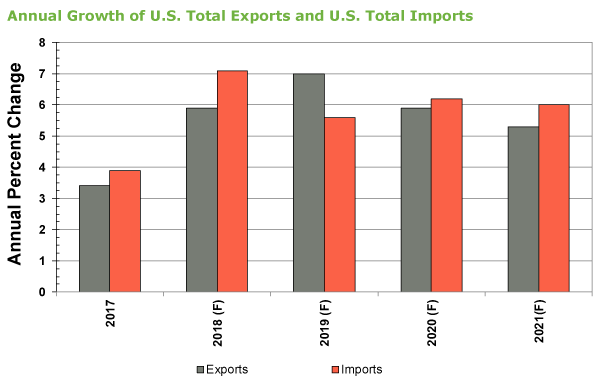 For most of the forecast period, however, the pace of import growth is expected to exceed the pace of export growth. Thus, trade pressures will remain an issue for the manufacturing sector even as economic conditions improve. Capital spending and exports are the two key drivers of U.S. manufacturing demand and profitability. With meaningful improvement in the outlooks for both, the prospect is for U.S. factory sector growth to be the strongest in more than a decade. We currently expect U.S. manufacturing sector growth to average 2.8% between 2018 and 2021, nearly double the 1.5% average growth rate that was projected. Buoyed by a widening global economic rebound, a falling dollar, and the passage of tax reform, the MAPI Foundation’s current outlook for U.S. manufacturing growth points to the best output performance in more than a decade. Stronger capital spending and export activity have translated into a manufacturing growth forecast of 2.8% for the 2018-2021 period, nearly double the 1.5% pace projected in our most recent, report. A tightening of financial conditions in the form of rising bond yields and the rapid correction of the inflated stock market is the key uncertainty in the current outlook, both as it pertains to Federal Reserve interest rate policy and more broadly to U.S. economic growth.